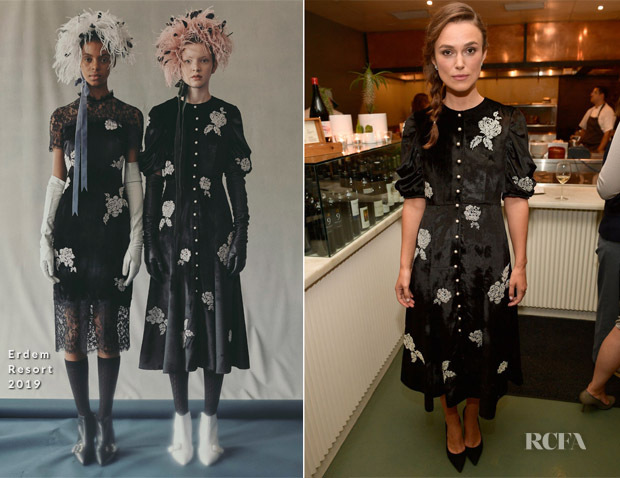 After Keira Knightley’s mix of Chanel and Rochas earlier in the week, the British actress served up a mix of Chanel and Erdem while she continued to promote ‘Colette’ during Toronto International Film Festival. Hollywood Reporter Party: Keira is known for her love for all things Chanel, but Erdem has always been one of her preferred designers too. This lush velvet look from the Resort 2019 collection is a testament to Erdem Moralıoğlu’s romantic vision. Glistening floral appliqués are crafted from scores of beads that imbue a delicate charm. The look was styled with Jimmy Choo’s ‘Romy’ pumps and her favourite Chanel ‘Camelia’ earrings. ‘Colette’ Toronto International Film Festival Premiere: As expected for the premiere, Keira wore a look from Chanel’s Fall 2017 Haute Couture collection. I do like the look, but it doesn’t have me screaming for BDOTW. And that’s what I want from a Keira Knightley look. Yes, it has plenty of period-drama and its full of charisma, yet, I’m not wowed by the look. Opting for her Jimmy Choo ‘Romy’ pumps again, she completed her look with Chanel’s ‘Camelia Coromandel’ earrings.